Missing Harp – since September 2016 or 2017 – not sure. Dear Area harpists, I am tracking down a harp rented by T. F. in September last year. If you have it or any information would you please contact Evelyn Castiglioni (info below). Last known address of renter was Mansions on the Park in Magnolia (TX). Look for a new release by Darhon Rees-Rohrbacher late summer 2018 – “The Lively Bard” – samples here! This month’s free download is “La Playa” from Louise Trotter’s Puerto Rican Sketches. You can download it HERE. Louise Trotter is a well-loved U.S. harpist, composer and arranger. Since early childhood she has had musical training in both piano and harp. She studied harp at Texas Women’s University and also with Mildred Dilling. Louise has been awarded two Lifetime Achievement Awards; one by the International Society of Folk Harpers and Craftsmen in 2003, and a second by the Somerset Folk Harp Festival in 2014. She plays a varied repertoire, from classical to Broadway, swing, Latin, rag, jazz, or folk, and is one of the few harpists who specializes in country music. 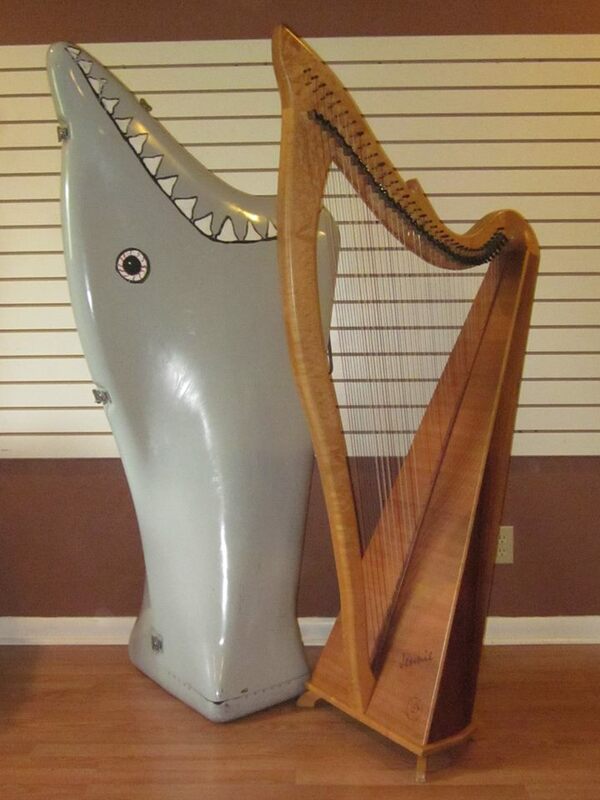 Great deals on used harps! In Mahogany finish with Bronzing, this Venus Concert Encore model pedal harp SN: 2196 has just received a full new set of strings. Sounds great! Well loved, it was a “stay-at-home” harp for the single, original owner – i.e. rarely moved – which is why it is in excellent condition. It’s a nice set-up at this price! 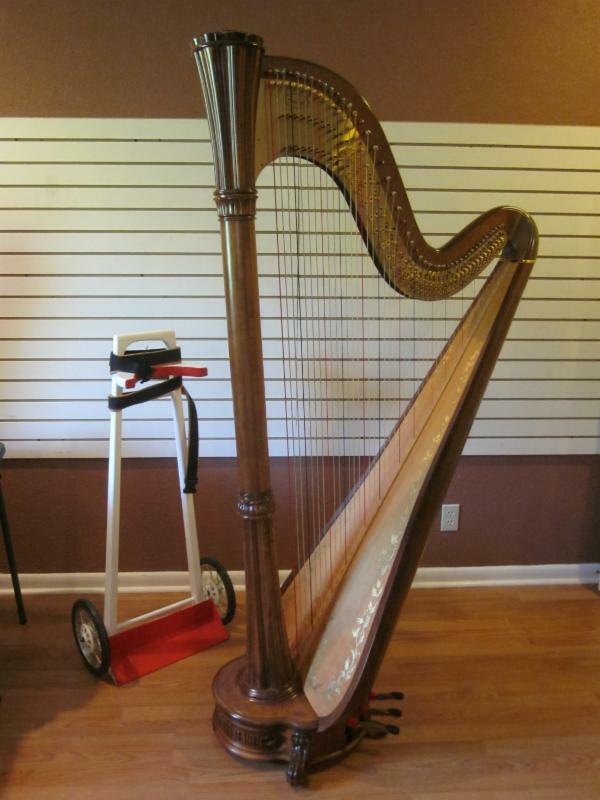 Reduced prices on used harps! From 2002 is a very unique instrument built by Mike Maley of Lionwood Harps. It is his standard Bridget 36 model in gorgeous Hawaiian Koa wood with the neck and column of Birds eye Maple. 61″ at the column peak, back at 48″ with the solid spruce sound board 18″ across at the bottom. Her name is Jennie as illustrated by the signature burned in at the bottom of the sound board. She liked to shine on stage so there are battery operated lights under the neck and the installed Fishman transducer made sure all could hear her beautiful, crystalline tone! The included custom fiberglass hard shell case kept her safe (and the whimsical art work attest to her very playful quality!) 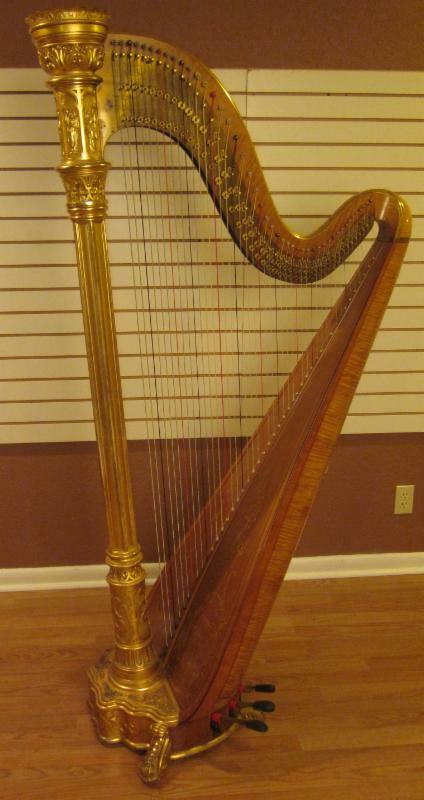 This harp remains on the planet while the owner, a good friend to many of us in the Houston area, has taken on her new experience. 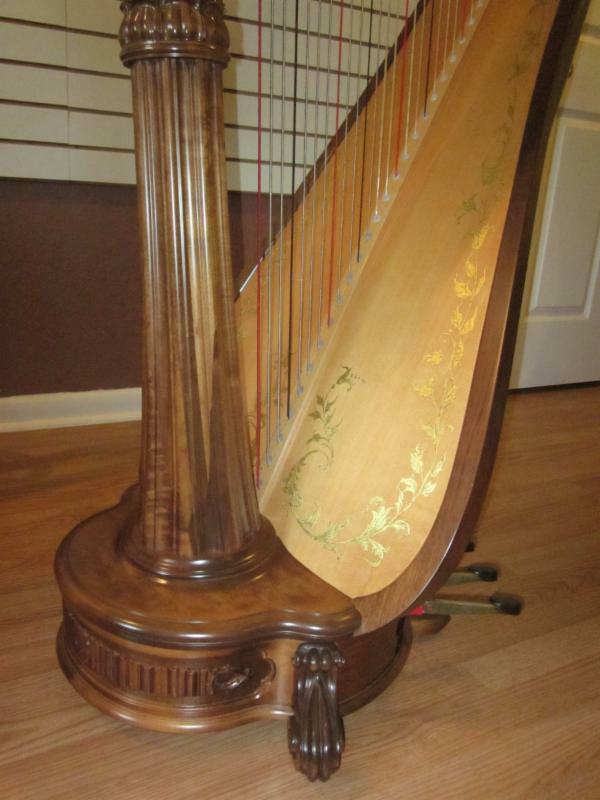 Beautiful used Salvi Diana Concert Grand Pedal Harp in Walnut Finish SN: 3526 Purchased in 1982, this has been a one-owner harp lovingly played at home for personal pleasure. Moved very little, it is in pristine condition. Although health issues prevented the owner from playing it the past 2 years, it was well maintained with a full string change and complete regulation by Peter Wiley in 2014. 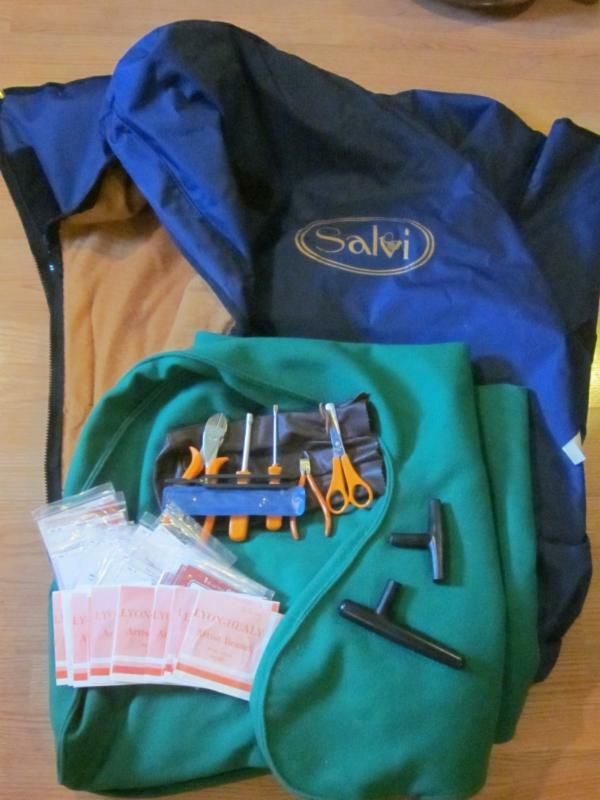 Beside the dolly pictured with the harp, included is a dust cover, heavy-duty padded transport cover, tuning keys, tool kit and spare strings for the top 3 octaves plus a wooden Salvi transport trunk. This harp did experience an issue with the center strip slipping out of alignment causing the string holes not to match. Shipped to Lyon & Healy in 2002, a new soundboard was installed with repairs completed in June 2003. The 24 is from 1905 and in excellent condition! 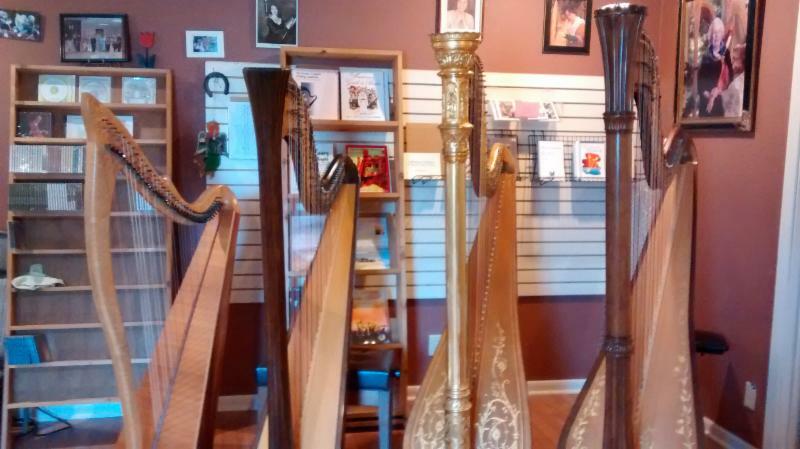 Here is a you tube of the harps in the shop that John prefers not to repair. If you are interested in any of these harps on an “as is” basis, please let us know.